I feel bad for anyone who wandered around the Copley area this afternoon. Kids in freaky costumes took over the Prudential Mall, and a bunch of kooks started a random pillow fight on Copley Square and left a big mess of mud and feathers in their wake. So, of course, I was there for both events. Anime Boston has been going on all weekend—it started on Friday and today, Saturday, is the biggest day with all the headline events. I was there to take pictures of my friend Ger in her costume (she was Tifa from the video game Final Fantasy 7) and to attend the EXTREMELY awesome concert by The Pillows. But more on that later. 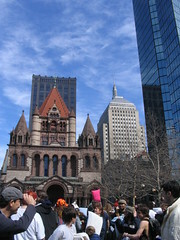 At 2pm sharp on a clear afternoon, an airhorn sounded on Copley Square and hundreds of people of all ages started thwacking each other on the head with fluffy pillows. It was a beautiful sight. And there were tons of people to see it since the event was thoroughly hyped in local media and, at times, it seemed the number of gawkers and photographers far outnumbered the actual pillow-fighters. But that didn’t really matter since it was still a real hoot. Turnout was really amazing. The last pillow fight was at most 100 people, this time it was easily 500 or so with about the same number of onlookers. Many of the costumed kids at Anime Boston made their way to this event, so the pillow fighters were definitely a colorful crowd. My favorite scene at the pillow fight was one of the costumed Banditos running around the crowd, waving the state flag of Massachusetts. A standard-bearer and a target! To my surprise, he ran up to me a few minutes into the event and called my name. Ends up, under the mask, it was a friend of mine who had recently joined the ranks of the Banditos Misteriosos. He was so kind to oblige me by posing with the flag—now that’s Massachusetts pride! Many people saw me talking to one of the Banditos and asked me what political cause this rally was for. What’s sad is that nobody seemed convinced when I told them this was just for fun. I’m not sure if it speaks to the level of cynicism in our society or just the extreme silliness of the event. Probably both, huh? Unfortunately I couldn’t stay very long, and I heard the event lasted until about 3pm, which sounds about right. The pillow fight on the Common last December went for about a half hour, but the crowd was a lot smaller and we got tired only 15 minutes into it or so. I’m really, really glad that the Banditos Misteriosos are around. Anything to help Boston shake its stodgy reputation is most welcome in my book. So yes, as I mentioned earlier, my friend Ger and I were at Anime Boston for the day. The highlight was definitely the concert by THE PILLOWS. This is an awesome punk/rock group hailing from Hokkaido that has earned a lot of international acclaim: They’ve played SXSW and have toured in the U.S. several times at major music halls like the Knitting Factory in NYC. Basically The Pillows is one of the few groups from Japan that pretty much anyone who listens to rock nowadays has heard of, and for good reason, because they are freakin’ fantastic. Almost all of the attendees of Anime Boston lined up to hear them and we filled the Hynes Convention Center main event hall to near-capacity—that’s almost 4,000 people. For a good hour they had everyone on their feet, cheering, hopping and singing along with brand-new tunes as well as classic crowd-pleasers, like “Ride on Shooting Star.” If you’ve never heard it, you really should. Unfortunately photos were not allowed, so I don’t have any pictures of the concert. Ger and I were also at the very far back of the balcony so photos would have turned out quite poorly anyway. All that mattered was the music, and believe me, it reached us loud and clear even way in back! Anime Home Planet Blog » Blog Archive » The Banditos Misteriosos Strike Again! All in all, it was a pretty amusing day in Boston. i’m the one who split her pillow – the feathers got it going again!! Hope no one inhaled too many! Good times – see you next year! !